Elise Stephens began her career in writing at age six, illustrating her own story books and concocting wild adventures. She earned her degree in Creative Writing at the University of Washington. Stephens counts authors Neil Gaiman, C.S. Lewis, and Margaret Atwood among her literary mentors, and has studied under Orson Scott Card. She dreams often of finding new ways to weave timeless truths into her stories. She is a recipient of the Eugene Van Buren prize for fiction. 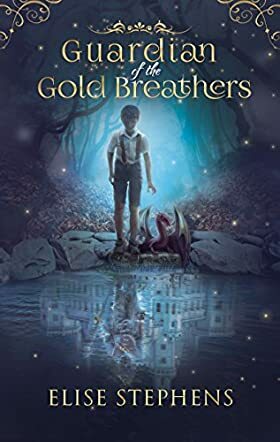 Guardian of the Gold Breathers by Elise Stephens is the story of 12-year-old Liam’s adventure into a world of magic, fairies, dragons and fantasy. Liam’s father has died, his mother remarries scientist Dr Parker, and they move to a large house on the edge of a mysterious forest. Liam dislikes his stepfather and worries that he will use the family pet dog, Benson, for his medical research. The blind gardener, Michael, tells Liam about the Far Country or land of Tir No Nog and how a path to this extraordinary place opens up in the forest every five years. It seems Liam is the long awaited next Guardian of the Gold Breathers (dragons) who must succeed at set tests, enter the land, and restore peace and harmony. Can Liam save Benson, overcome his fears, and develop the courage to pass the tests to show his bravery, loyalty and obedience? Liam himself is brave, real and likable, and young readers will side with him as he copes with the emotional toll of loss and change, and his determination to pass the tests he has been set. He seems at first to be a sad little boy having little say over what happens, but then finds friendship, strength, purpose and happiness in a whole new world. There are several lovely messages about loyalty and love, discovering yourself, tolerance and understanding in this story, giving it an extra depth. Liam tries hard to understand his stepfather’s motivations, even though he doesn’t like what he does. Elise Stephens has written a magical, inspiring and thought-provoking tale. The book has a well-thought out plot that unfolds at a good pace with plenty of mystery, suspense and magic as it does so. There are some lovely descriptive pieces, and I loved the idea of the hidden path into Tir No Nog and renaming dragons “gold breathers.” The fantasy characters enable Liam’s own character to develop and mature as he finds himself and uncovers the truth about the challenges he has been set. A lovely mixture of fantasy, magical happenings, overcoming threats and dangers, and the strength and development of character that occurs when difficulties are faced. A well written book, Guardian of the Gold Breathers will be enjoyed by young fans of fantasy and magical adventures.